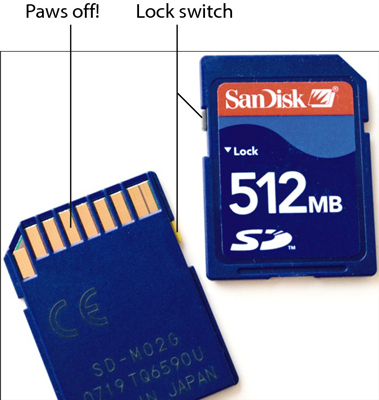 A digital camera’s memory card is key to recording images. 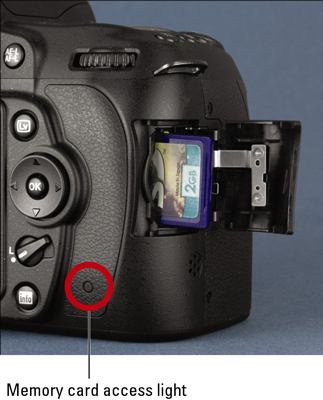 Read on to see how to insert or remove a memory card in your Nikon D90, format it, or even protect the digital photographs you’ve stored on your SD card. What kind of memory card? 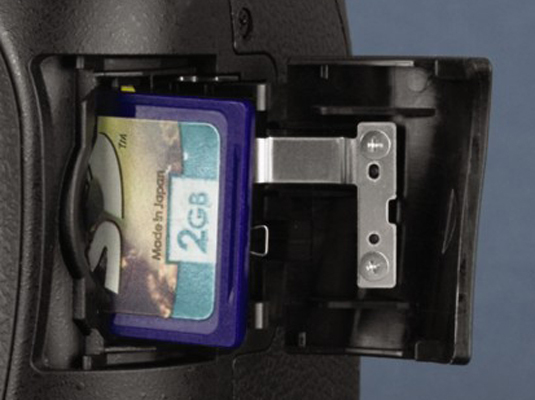 The Nikon D90 uses a specific type of memory card called an SD card (for Secure Digital), shown here. You can also use the new, high-capacity Secure Digital cards, which are labeled SDHC, as well as Eye-Fi SD cards, which enable you to send pictures to your computer over a wireless network. First, be sure that the camera is turned off. Then put the card in the card slot with the label facing the back of the camera, shown below. Push the card into the slot until it clicks into place; the memory card access light (circled in the figure) blinks for a second to let you know the card is inserted properly. There are two ways to format a memory card using the Nikon D90. The first is to simultaneously press and hold the Delete and Metering Mode buttons. Both buttons have little red Format labels next to them. Hold the buttons down for about two seconds, until you see the letters For blink in the Control panel on top of the camera. (The other data visible is the Shots Remaining value, which indicates how many pictures you can fit on the memory card at the current Image Quality and Image Size settings.) While the display is blinking, press and release both buttons again. When formatting is complete, the For message disappears, and the Control panel display returns to normal. The second is to choose the Format command from the Setup menu. When you select the command, you’re asked to confirm your decision to format the card. Highlight Yes and press the OK button to go forward. If you insert a memory card and see the letters For in the Shots Remaining area of the Control panel, you must format the card before you can do anything else. Formatting erases everything on your memory card. So before formatting, be sure that you have copied any pictures or other data to your computer. After making sure that the memory card access light is off, indicating that the camera has finished recording your most recent photo, turn the camera off. Open the memory card door. Depress the memory card slightly until you hear a little click and then let go. The card should pop halfway out of the slot, enabling you to grab it by the tail and remove it. When no card is installed in the camera, the symbol [-E-] appears in the Control panel and viewfinder. Don’t touch the gold contacts on the back of the card. When cards aren’t in use, store them in the protective cases they came in or in a memory card wallet. Keep cards away from extreme heat and cold as well. The tiny switch on the left side of the card, labeled lock switch in the figure below, enables you to lock your card, which prevents any data from being erased or recorded to the card. Press the switch toward the bottom of the card to lock the card contents; press it toward the top of the card to unlock the data. You can protect individual images from accidental erasure by using the camera’s Protect feature.